Here, is a very short and step by step tutorial on how to prevent uninstallation of Metro apps. Metro apps are something which make Windows 8 different from that of other Windows version. And uninstalling Metro apps is uncomplicated, all you need to do is to select the metro app by right clicking on it and selecting the “uninstall” option displayed at the bottom of the screen. Uninstalling Metro apps is so easy that sometimes you may even accidentally or unintentionally uninstall any Metro app. So once you have created Metro apps the way you want in Windows 8, then its essential that you should prevent uninstallation of those Metro apps. Follow each and every step mentioned below to prevent uninstallation of Metro Apps. Don’t forget to check out our recently posted tutorial on How to disable or turn off Windows 8 live tiles. Move the mouse cursor and place it on the bottom right corner of the screen and select the search option. Enter gpedit.msc in the Windows 8 search box and simply hit the “Enter” key on your keyboard. Local Group Policy Editor window will appear in front of you in which you need to firstly select User Configuration << Administrative templates << Start menu and taskbar. From the list of policy settings, you need to select “Prevent users from uninstalling applications from start” by double clicking on it. Now, you need to click radio button left to Enabled option and hit the OK button to remove or hide the uninstall option displayed on the start screen. The changes take place immediately, so it’s not necessary that you restart your computer for the changes to take place. Earlier, before making these changes uninstall button appeared as shown in the above screenshot. Now, you can right click the same app and see the uninstall option is vanished. 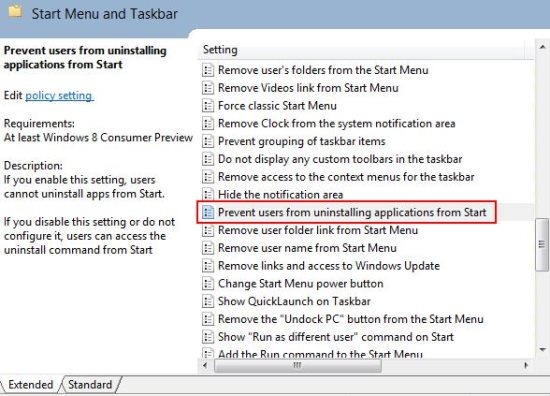 Follow these simple steps to prevent uninstallation of Metro apps in Windows 8.